WATCH: TAXI DRIVER SAVED FROM DROWNING! 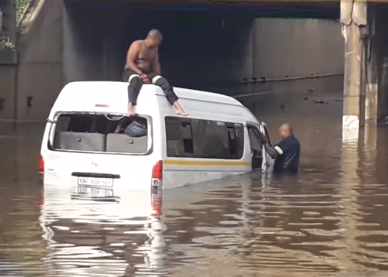 A video of a taxi driver trapped in a sinking taxi had surfaced on social media. The driver identified as Richard Wamusi, reportedly tried to drive through the flooded bridge, which resulted in the taxi sinking. Ekurhuleni Emergency had to rescue the taxi driver from drowning, as the taxi was sinking in the flash floods. The driver was reportedly transporting children before the incident which occurred at Stoffberg Avenue, in Brakpan. However, when the incident happed he was alone in the taxi. According to Brakpan Herald, the road had filled up with water within minutes after a storm just before 6am.